On this page you'll find free plans for some of the projects I've designed and built. A summary of all my project pages and plans is at the bottom of this page. Each of these plans was made using a Unix program called xfig. Xfig is a very simple, vector-based drawing program that is easy to install on virtually any Unix platform. After generating the diagram, the file is exported as Postscript, and inserted into a TeX document. I produce Portable Document Format (PDF) files using PDFTeX. These files should be viewable on virtually any modern computer. They require Adobe's Acrobat Reader 4.0 or higher. Some versions of Acrobat and Acrobat Reader 4 are unable to print the dashed and dotted lines, even though they appear on the screen and in the Print Preview display. This problem has been fixed in Acrobat Reader 5.0. If you are using Acrobat or Acrobat Reader 5 and the fonts do not display or print correctly, you need to download a newer version of the program from Adobe's web site. Version 5.0.1 (released March 2001) fixes the font problem. If anyone is interested in these plans in other formats (Postscript, TeX sources, PNG, on paper, etc. ), feel free to drop me a line and I'd be happy to send them to you in your favorite non-proprietary format. A note about the Copyright that appears on the plans -- you can copy the plans as much as you want, transfer the files around, etc., under the condition that the original Copyright appears on the copies. That way I get credit for my work. You can also make a new set of plans based on my plans, but if you intend to publish your modified version, you must also offer it as openly as I have done. This keeps my ideas out in the public domain, where ideas belong. My next project will be a small display cabinet we can hang on the wall to display small items like my wife's musk ox collection, or the various animal skulls I've collected over the years. The project is inspired by a display cabinet in James Krenov's A Cabinetmaker's Notebook, pages 78 - 81 (the photo on page 78 is pictured on the right). I've decided to use through dovetails to join the top and bottom to the sides, and I'll probably use wood for the shelves, but the dimensions and look to the piece will be similar. The project only uses about 10 board feet of wood, so I'll probably use a wood I've never used before. I haven't started building the project yet, but have developed a set of version 0.1 plans (PDF format, 147 Kb). There's also a web page that will show my progress as I'm building the project, but right now this page is just a place holder. After remodeling our living room we needed a better place to store our DVD's. I designed this cabinet based on Michael Dunbar's Colonial Cupboard hand tool project in Fine Woodworking, Number 151 (October 2001), pages 64-71. The case is a dovetailed box with a mortise and tenon face frame and door. Shelves are set into dadoes in the sides and the back is formed from tongue and grooved boards. I have a web page that shows my progress on this project, and am working on a set of plans (PDF format, 124 Kb) for download. At this point the plans include measured drawings and a cut list, but I still need to work on the construction details. This project is the hand tools version of the Monestary Table Norm Abrams built in the 2003 season of The New Yankee Workshop. 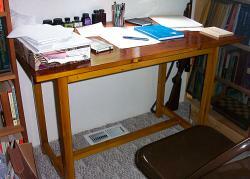 It can be used as a small kitchen table, a writing table, or as a place to pay bills. The size can be customized to fit anywhere you like, but my version is about 28 1/2 inches tall and the top is 43 inches by 24 inches. It's a nice project because it's simple and can be finished quickly with a minimum of materials and tools. 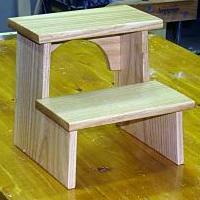 Construction is entirely mortise and tenon joinery, with through tenons used for the foot rail. I built mine from rough cut white spruce slabs left over from the milling of our spruce siding. The table is finished with dewaxed garnet shellac. I am working on a set of plans (PDF format, 66 Kb) for download. At this point the plans include measured drawings and a cut list, but I still need to work on the construction details. These are plans based on the spill plane Roy Underhill made on The Woodwright's Shop (2002 season, episode 2205). Before matches were a commonly available item people would run a scrap of wood over a spill plane to generate long, tightly curled shavings of wood (called spills). These were typically in a jar above the fireplace so that when you needed to light a candle or your pipe, you could grab a spill, light it in the fireplace and take the flame with you. These planes came in a style where the plane was run over a piece of wood, or the variety shown here, where the plane is affixed to the bench and a piece of wood run across the plane. You can also see some photographs of the construction at this web page. The image on the right shows the plane in use. The spill is coming out the right side of the plane from the board on top. The plans can be downloaded here (PDF format, 89 Kb). These are a set of bookshelves I'm building for the Alaska Bird Observatory. They're approximately seven feet tall and nine feet long. The shelves are build from three seperate, dovetailed boxes which are joined together and rest on a base. 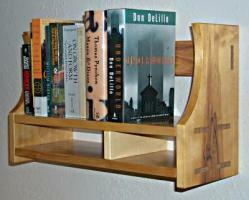 One of the shelves is fixed and the rest are adjustable on holes drilled into the sides. A baseboard molding hides the bottom support, a crown molding dresses up the top of the case, and vertical moldings hide the joints between the shelf cases. I don't have an image for these yet because I haven't built them! But I'm working on them, and I have a web page showing my progress, as well as a set of plans (PDF format, 85 Kb) for download. 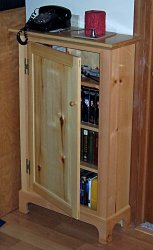 Here's a great project that'll really exercise your woodworking abilities -- a set of medium height bookshelves held together with dovetails. This project also allows for a lot of customizations. If you wanted adjustable shelves, only the top and bottom shelves need to be fixed and the remaining shelves could be supported by shelf pins. The case can be dressed up with a face frame, crown molding and a floor molding that hides the space at the bottom of the shelves. A cabinet could also be added to the bottom of the case by adding a center partition, fixing the bottom two shelves, and installing door to the face frame. All in all, a very versatile project. Click on this link for my plans: Acrobat Reader (PDF) plans (69 KB). The inspiration for this project comes from the ``Sewing Steps'' shown on page 142 of Christian Becksvoort's The Shaker Legacy, Perspectives on an Enduring Furniture Style. Sewing steps provide a foot-rest for someone sewing by hand in a seated position. It's also an easy project that uses less than 2 board feet of hardwood. I made this project for my mother, who makes beautiful quilts, mostly by hand. Click on this link for my plans: Acrobat Reader (PDF) plans (92 KB). 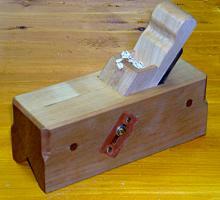 This is my version of the chamfer plane that appears in John M. Whelan's Making Traditional Wooden Planes. Rather than stick with tradition, I decided to make a two piece laminated body. This makes cutting the mortise for the stop, wedge and iron much easier, and it allowed me to make the V sole by planing an angle on each half of the plane body. The iron is made from a piece of O1 tool steel, hand shaped, hardened in the wood stove and tempered in the oven. Click on this link for my plans: Acrobat Reader (PDF) plans (65 KB). 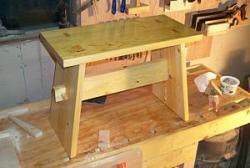 I based these plans loosly on the Roubo workbench that appears in The Workbench Book by Scott Landis. It's basically a sturdy table with a thich top that uses timber frame joinery in it's construction. My version is built using construction grade lumber (2 x 6, 4 x 4 pine or fir). The design allows for a lot of customizations depending on what you want to do with the bench. Since I already have a bench with an end vise and a twin screw vise, I will customize mine with a thick leg vise, bench hooks, a couple planing stops, and holes for iron holdfasts. This is basically the setup shown in The Workbench Book, except the construction details are a bit different (who has a 5" thick slab of hardwood anyway?). Click on the image to download the plans, or this link: Acrobat Reader (PDF) plans (88 KB). These plans are heavily based on an article that appears in Fine Woodworking, Issue 148, pages 108-113. If you want more details that appear here, or want to see another (power tool oriented) method for building a magazine cabinet, please consult the magazine. I have a step by step construction tutorial at this page. 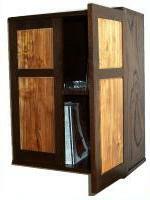 The cabinet is approximately 24 inches wide, 12 inches deep, 30 inches tall and has a single shelf centered inside. The main carcase is built from solid oak dovetailed together on the top and bottom, with the back assembly and the two doors built with with frame and panel joinery. The middle shelf fits into a sliding dovetail in the carcase sides, and the back assembly fits into a dado that runs around the inside of the cabinet. My version of the cabinet is built with red oak, stained using a dark mission-style finish. The door panels will be made from a lightly colored wood to contrast the dark oak. Click on the image to download the plans, or this link: Acrobat Reader (PDF) plans (94 KB). I've got some really rough plans for my sawbench project (my other plans are much more detailed than this sketch). The project is so simple, you really only need the appropriate dimensions and a couple photographs of the shape and joinery. A few other photos of the bench are on my projects page. I made my sawbench by jointing and laminating quite a few pieces of pine recovered from an old shipping crate. Doing all that sawing, jointing, laminating, and planing flat really builds confidence for building a more sophisticated project out of more expensive wood! Click on the image to download the plans, or this link: Acrobat Reader (PDF) plans (3 KB). 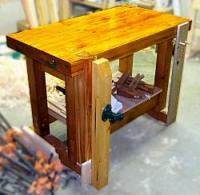 This is a great project to exercise your woodworking skills without using a lot of wood. The plans were inspired by the shelves shown in James Krenov's A Cabinetmaker's Notebook (page 37 of my copy) and The Fine Art of Cabinetmaking (near the end). A step by step tutorial on how I built them can be found on this page. The plans call for about 6 board feet of wood, and the final dimensions are 8 inches deep, 21 1/4 inches wide and 13 inches tall. There is a single shelf that is 8 1/4 inches tall, and a narrow shelf at the bottom with a small drawer on the right hand side. Click on the image to download the plans, or this link: Acrobat Reader (PDF) plans (70 KB). These are plans for a small end table that I used as a bedside table in our guest bedroom. It's got tapered legs and breadboard ends that hide the edge grain on the jointed top. It's a great project, and only takes a few hours of shop time to complete. 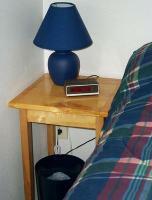 When I made this project, I was still on the dark side -- using power tools for all of my woodworking. Now that I've become a OldTool user, I might do some of the project differently. Click on the image above to download the plans, or this link: Acrobat Reader (PDF) plans (74 KB).